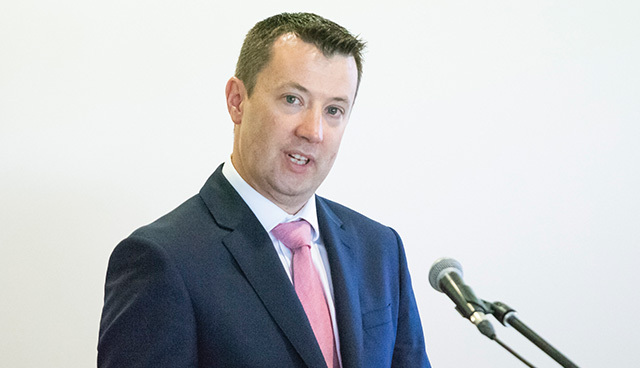 Principal Officer for Heat and Transport Energy Policy at the Department of Communications, Climate Action and Environment, Kevin Brady spoke at the Energy Ireland 2018 conference and outlined the measures being undertaken to correct the shortfall on renewable heat targets to 2020 and discussed the challenges in developing a roadmap to 2030 in line with EU ambitions. With European policy for the next decade now agreed, Kevin Brady outlined that much like up to 2020, the Renewable Energy Directive is set to be the main driver of policy in Ireland. Following on from agreement in June 2018 for the Energy Union Governance Regulation, Ireland, like all member states, will now be required to submit their national energy and climate plan out to 2030 to the Commission by the end of 2018. How Ireland develops its future roadmap will be somewhat shaped by a change in process of the European Commission (EC), he explained. Unlike targets for 2020, where Ireland had a clearly defined 16 per cent goal, member states will now be required to contribute to an EU-wide renewable energy target of 32 per cent by 2030. Brady explained that ambitious mechanisms have been written in to the Governance Regulation, meaning that once national plans have been submitted to the EC, a revision period will ensue and the Commission is expected to issue recommendations back to member states by mid-2019. The outworkings of this is, that if there is a gap at EU level, recommendations will be made to member states in order to cover the gap. Turning to what this means for the heat sector, Brady explained that much like the 12 per cent target set by Ireland as part of the national Renewable Energy Action Plan, Ireland will again be responsible for outlining its own contribution. However, it must take into consideration Article 23 of the revised Renewable Energy Directive which sets an indicative target of a 1.1 per cent annual increase of renewable energy in the heating and cooling supply. Brady noted that to date, Ireland has fallen well short of its 12 per cent target, with projections of 9 per cent by 2020. Recent estimates for 2017 renewable energy performance show that Ireland is at, if not slightly ahead, of the EU average in the electricity and transport sectors thanks to the build out of wind and the biofuels obligation scheme, respectively. In heat however, Ireland has not seen as significant an increase and remains behind the EU average. Brady assessed that by analysing countries with similar performance, such as the UK and the Netherlands, the common theme is of large amounts of fossil-fuel heating in domestic households. “In Ireland it’s a lot of oil but in the Netherlands and the UK it’s a lot of gas,” he explained. In terms of policy, Brady points out that while the upcoming National Energy and Climate Plan, the roadmap to 2030, is probably the most important factor in Ireland’s future renewable performance, the existing National Planning Framework (NPF) and the National Development Plan (NDP) will also be influential. He explained that the NPF, the spatial strategy to 2040, for the first time gives district heating “prominence in a national planning strategy”. The NPF outlines that district heating networks will be developed “where technically feasible and cost effective” for all five cities outlined in the plan. Other policy objectives included in the plan centre on promoting “renewable energy use and generation at appropriate locations within the built and natural environment” and promoting “energy efficient buildings and homes, heating systems with zero local emissions”. Brady also highlighted the inclusion of a number of policy statements within the framework, one of which states that it will “support new initiatives in district heating [such as the Dublin Docklands’ District Heating Scheme] in cities and large towns”. Welcoming this, Brady highlighted the importance of the Dublin Docklands scheme and other similar schemes in trying to bring heating at scale into Ireland for the first time. 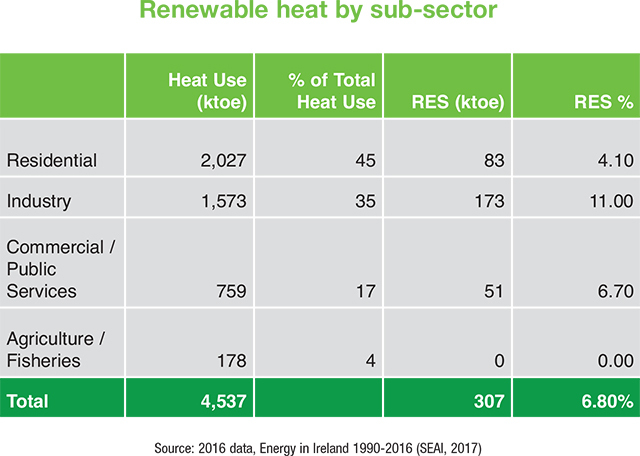 Assessing renewable heat in Ireland by subsector, Brady stated that recent data shows low renewable penetration at residential level, with a renewable energy source in the heat sector (RES-H) of 4.1 per cent. Comparatively, industry has an RES-H of 11 per cent and commercial/public services has a 6.7 per cent RES-H. He explains that the high industry percentage is being driven by geothermal ambient i.e. heat pumps, but mostly through Biomass. Currently around 40 per cent of homes in Ireland are heated by oil, 34 per cent using natural gas, 10 per cent use peat/ coal and electricity heats around 9 per cent of homes. and the decarbonisation of gas. Concluding, he said that two key future steps being progressed currently are around the continued development of national policy measures including around building regulations; heat pump supports and the Support Scheme for Renewable Heat. The second step involves the development of the National Energy and Climate Plan up to 2030, encompassing the requirements of the Renewable Energy Directive, including Ireland’s contribution to the 32 per cent overall EU target.